About: A condition in which the force of the blood against the artery walls is too high. This poses a serious risk to many organs of the body including the eyes, kidneys, brain, arteries, and heart. Symptoms: Most cats with high blood pressure will be asymptomatic and the condition is often diagnosed during a routine examination. Causes: Underlying medical conditions such as kidney disease, hyperthyroidism, and Cushing’s disease. Diagnosis: High blood pressure is easy to diagnose with a cuff and doppler to measure pressure within the arteries. Any cat who has been diagnosed with kidney disease, hyperthyroidism or Cushing’s disease must have their blood pressure checked regularly. Treatment: Manage the underlying cause, low salt diet, and medications to reduce blood pressure. Blood travels through the body via the arteries. Blood pressure is the force in which the blood is exerted against the walls of these arteries. Think of your arteries as a pipe, for cats with high blood pressure, the blood travels through these pipes at a higher pressure than normal. 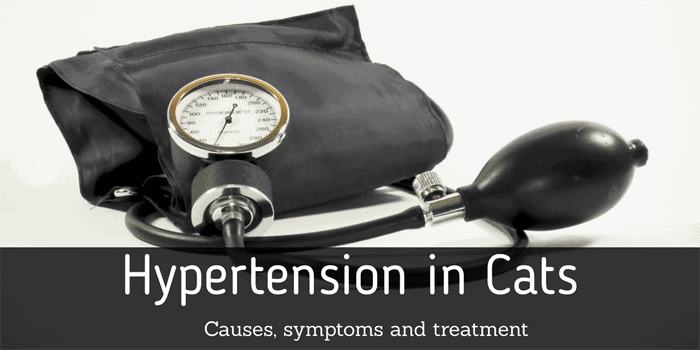 High blood pressure (hypertension) is something that most people associate with humans. Described as ‘the silent killer’ as high blood pressure can be present for a long time without any symptoms and only comes to light when a veterinarian checks the blood pressure. Most of us have had our blood pressure routinely taken by a doctor, and will be aware that there are two readings such as 120 over 70. Systolic pressure (high number) – The pressure in the arteries as the heart contracts and sends blood into the circulation. Diastolic pressure (low number) – The pressure when the heart rests between beats. 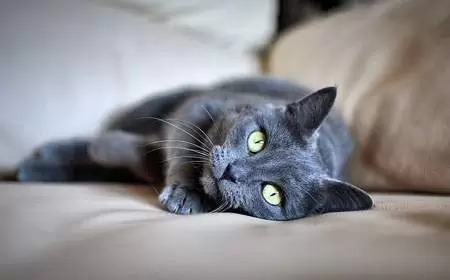 Primary hypertension (essential hypertension) is extremely rare in cats and most hypertensive cats have secondary hypertension, which is a result of an underlying disease. Common causes of high blood pressure in cats are hyperthyroidism, Cushing’s disease, and kidney disease. High blood pressure is an under-diagnosed disease, it affects 1 in 8 cats over the age of nine. Eyes: Swelling and bleeding into the eyes can result in blindness. A detachment of the retina can also occur and cause blindness. Kidneys: The kidneys act as filters to rid the body of wastes. Over time, high blood pressure can narrow and thicken the blood vessels of the kidneys. The kidneys filter less fluid, and waste builds up in the blood. The kidneys may fail altogether. Arteries: Over time, the arteries may harden, this, in turn, causes the heart and kidneys to work harder. Brain: High pressure can cause a break in a weakened blood vessel, which then bleeds in the brain. This can cause seizures, stroke or coma. If a blood clot blocks one of the narrowed arteries, it can also cause a stroke. Heart: The heart has to pump harder and over time this can cause the heart muscle to become enlarged and thickening of the left ventricle, and increase the risk of developing congestive heart failure. As mentioned, often there are no signs your cat has high blood pressure. Regular monitoring is necessary for cats suffering from underlying conditions such as hyperthyroidism. Visual impairment or blindness is usually the first sign of high blood pressure. Other symptoms may include, lethargy, depression, heart murmur and seizures. Symptoms relating to an underlying disease such as hyperthyroidism and kidney disease. 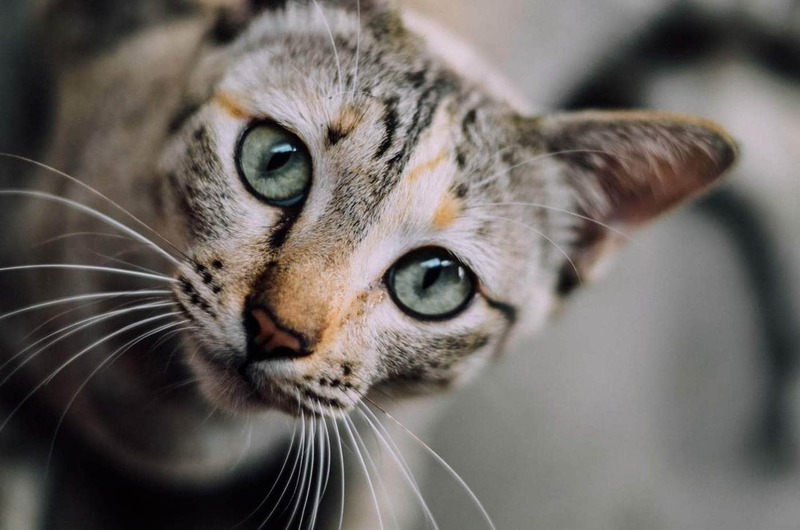 Between 20-60% of cats with chronic kidney disease also have high blood pressure, however, a recent study in the UK found that only 1.3% of cats had their blood pressure assessed. The study involved 347,889 and found 19.5% of cats had high blood pressure which shows the problem is way under-diagnosed. Any cat who has an underlying condition such as kidney disease or hyperthyroidism may have high blood pressure too. In fact, all cats over the age of seven should have their blood pressure checked during their annual or bi-annual veterinary examination. An inflatable cuff is placed on the cat’s front leg or tail. In humans, a stethoscope is also used, this isn’t possible in cats and a Doppler or oscillometric device is used instead. Your veterinarian will also do a complete physical exam to determine how much damage has been done to the organs as a result of this condition. This will involve dilating the pupils to examine the back of the eyes, as well as assessing the heart, neurological system, and the kidneys. It is important to identify and treat the underlying disease which is causing high blood pressure such as hyperthyroidism or kidney disease. Medication which helps reduce blood pressure, these are usually calcium channel blockers, beta blockers, ACE inhibitors, and diuretics. Amlodipine, a calcium channel blocker is the most common medication, it won’t cure high blood pressure but will help to control it. It is important that a cat with high blood pressure is regularly monitored. If the underlying condition which has caused the high blood pressure can be identified and brought under control some of the damage caused may be reversed. It is possible to cure hyperthyroidism, however, kidney disease is progressive, it can, however, be managed. It is vital to closely monitor blood pressure. If you notice any changes in your cat seek medical assistance immediately. Can You Catch Fleas From Cats?